Take a ride along the Chief Joseph Scenic Byway and end up at this 3-bedroom log cabin located at Crandall Creek, Wyoming nestled within the breathtaking Beartooth Mountains. This family cabin has all of the conveniences of home: full bathroom, well appointed kitchen, and washer and dryer. Gather around the fire pit after a day of fishing, atv riding or touring Yellowstone. With the river only feet from the cabin you can even catch your own dinner! Come in the winter and curl up by the fire with a great book or a movie. 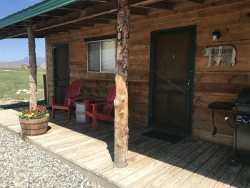 This is a great home base for snow mobile trips to Cooke City or a quiet day on the trails cross country skiing or snowshoeing. Bookings between October and April require a minimum 6 night stay. Great opportunities for fishing, canoeing, kayaking, hiking, hunting, cross country skiing, snowmobiling, and snow-shoeing. There are falls and lakes close by and Clark's Fork River is 100 yards from the cabin. Total Sleeping Capacity: 6 Max. NOTE: This property does not have A/C. Average temperatures in the summer are low 80's in the day and low 50's at night. More details can be found by clicking on Local Area Information - Weather on the navigation bar above. Holler's Hideout was exceptional! Spotless inside, convenient to streams and rivers for fishing. Had every amenity you could possibly want! They even provided firewood, coffee, and laundry detergent! Cute house and spacious yard to hang out in! Crazy Creek Falls is about 7 miles. Go to the jct and turn left and go about 2 miles, it is less than a quarter mile off the road on the right. Well worth seeing. Lake Creek Falls go to jct. and turn right go about 11/2 miles and it is about 100 yards off highway on left. Also worth seeing. Clay Butte Lookout Tower is about 12 to 14 miles from the cabin. Go to the jct. turn right go til you see the sign. Follow the road about 3 miles off highway. The view from there is awesome. Lily Lake is about 8 miles go to jct. turn right go about 11/2 miles the road turns to left about 2 miles off road. Excellent fishing and the kids can catch craw fish. **The jct refers to the junction of Wyoming Highway 296 and US Highway 212 about 4.5 miles west of the cabin. Numerous lakes beyond Clay Butte Fire Tower road and Crandall Creek also offer great fishing. There is a trail head just south of the cabin with good hiking. Also if you walk south from the trailhead and up the hill there is the remains of an old cabin. There is a lot of great ATV trails either direction from the cabin. Camp Creek 10 miles toward Cody is a good ATV trail or pickup trail, not recommended for a car. Beartooth Lake and Island Lake you can use motor boats, rafts or canoes. Many people kayak the Clarksfork river starting about 2 miles above the cabin down to the bridge. - Lodging tax is assessed on your rent rate. - A $39 damage insurance policy provides $3,000 in damage protection during your stay. You may decline this charge, but will be assessed a minimum $250 refundable deposit.